Depending on where you journey on your gap year, chances are that you may end up travelling by sea at some point. Whether you take the ferry to France, dart between Thai islands or enjoy a short sail in the Atlantic, travelling by sea is often a cheap alternative that provides gorgeous views, a chance to socialise and a dash of adventure that you may find no where else. If you feel in need of a high seas adventure, look for ways to incorporate travelling by sea into your gap year plans. Sailing safety depends upon multiple components including the safety of the boat itself, the captain and crew, and the weather forecast for the route ahead. Investigate the national or governing body of any registered ferry service, the owner of all private hire crafts and the service standard of your boat. You could also check such things as: the requirements and training for captains and crews, if your boat has registered its voyages, the weather forecast for the areas in which you plan to sail, the marine conditions for the areas in which you plan to sail and travel advisories for the areas at which you may dock. If you deem a ferry service or private boat safe enough to board, you will also need to defend your personal safety while sailing. Wear a lifejacket in small crafts. Identify the location of lifejacket storage areas on larger ferries. Stow your luggage only in designated areas. Keep your passport and wallet/purse on your person. Keep your travel documents and valuables in your daypack at your seat. Loop the straps of your daypack around your legs if you stow it under your seat. Keep bottled water and a nutritious snack with you on long rides. Do not leave your bags unattended. Do not supervise bags for strangers. Follow all instructions from captain or crew. Travelling by sea can be wonderful, but it may also require passengers to work for their comfort. To make the best of your sea situation, be sure to wear loose clothing that can shift with you and will keep you covered, wearing layers, so that you can adjust along with the temperature is also a good idea. Try to find a seat if you feel unsteady on your feet and do not lean over railings or run around the decks. Keep cool water and a small snack with you at all times, bring sunglasses and a hat if it is a bright day and bring your own iPod or mp3 player to help you relax and to keep yourself entertained. Seasickness occurs when the body's sensory perceptions are thrown off and as a result the brain becomes confused. Over 90% of the population will suffer from motion sickness at some time, and sailing often brings on a bout of seasickness. Symptoms of seasickness include: nausea and vomiting, dizziness and sleepiness, headaches a grey or green complexion, clamminess and also sweating. Though it may be hard to prevent a bout of seasickness, many travellers do find relief from taking long, slow breathes and sipping water. Another method to try is laying a cool, wet cloth across the neck or wrists. Stay above deck and try and position yourself to catch a breeze. There are special wristbands that you can buy that help to control your pluse rate (they are inexpensive and they worked for me!). Taking over the counter medicine recommended by a chemist is another option as is wearing patches behind the ear, which your GP can prescribe. Travelling by sea on your gap year is a great way to try something new and make your journey a destination in itself. 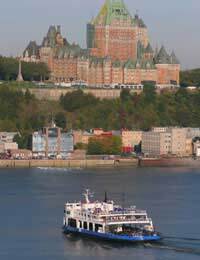 Many boats and ferries will allow tickets to be purchased in advance or over the Internet, but always prepare to arrive early for your intended route.